College students have had a hard time voting in Pennsylvania, especially black college students. 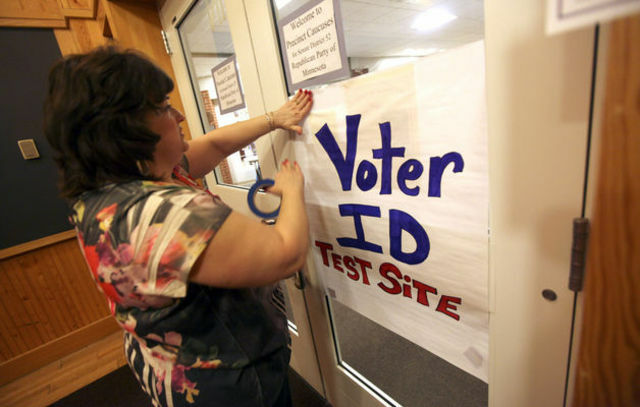 Things just got a lot harder for them thanks to the voter ID laws sweeping the nation. Pennsylvania Republican Governor Tom Corbett wasted no time signing HB 934 into law after the legislature voted it through with not one Democrat in support and in fact a few Republicans that opposed. That vote happened yesterday afternoon and Corbett’s ink was on the bill by the evening. The law goes into effect today mandating that all voters have photo identification issued by state or federal government, a state university or a nursing home. The state becomes the sixteenth with a photo voter ID bill, and the ninth with a strict photo voter ID bill, meaning unlike other states there’s no alternative non-photo ID that can be used if you show up without proper photo identification. The granting of nursing home IDs (is there such a thing?) as an eligible voting ID was fought in as an amendment by groups like AARP, a voting bloc that Corbett and fellow Republicans apparently care about. Other groups, like low-income, college students, didn’t fare as well. ACLU legislative director Andy Hoover told me that amendments that didn’t make the final bill included one made for people to sign an affidavit to vote if they didn’t bring photo ID and another to qualify a Medicare card as an eligible ID to vote. Local civil rights group Black Political Empowerment Project told Governor Corbett in a letter that allowing nursing home IDs is fine, but there are thousands of elderly voters who are cared for at home, not at care facilities. Those would be senior citizens from low-income families who can’t afford nursing homes. As for college students, there are plenty in the state whose student ID cards don’t have expiration dates. PA’s voter ID bill allows only for college IDs with expiration dates. Below is an identification card for a staff member at Bloomsburg University, a state college. It’s identical to the student IDs and there is no expiration date, only an issue date. On the topic of college students, they seem to be a group that have had a hard time voting in Pennsylvania historically, especially black college students. After the 2008 presidential elections, when hundreds of students from the HBCU Lincoln University stood up to seven hours in the rain to vote, the ACLU filed a federal lawsuit on their behalf because the county had moved the polling place to a small facility far from Lincoln’s campus. At the university, voter registration drives had anticipated a record turnout for the election that brought about the first African-American president, but Chester County wouldn’t move the polling place to a larger facility on campus that could accommodate the huge swell of new registered voters. “After voters complained about conditions in the 2008 election, in which some people waited as long as seven hours to vote, the county responded by moving the polling place even further away from campus,” ACLU’s Hoover told me. Who is she talking about when she says “those not legally allowed to vote”? Taylor has worked on voting rights, GOTV, voter registration and voter protection campaigns since 1999 at national, state and local levels. She works with a coalition that includes dozens of organizations around the state including not only civil rights groups like the NAACP and League of Young Voters, but also the County Commissioners Association of Pennsylvania. The County Commissioners are not an advocacy organization. They are an association of county government administrators who are on the frontlines of every election, staffing the polls and dealing with all the problems that occur on election days. And they oppose this new law. But Governor Corbett believes he has signed a “law of prevention” against voter fraud.